The availability check may not be updated due to telephone or email bookings not promptly entered. Therefore the reservation must be confirmed by us via email. Tourist tax to be paid upon arrival (not included in the count): 1.50 euros per person per night, for a maximum of 10 consecutive nights, for adults and children from 15 years of age. 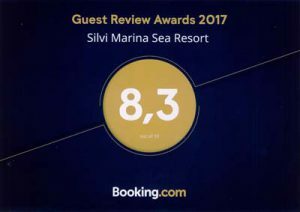 For more information call 085-930339 or contact us by email info@silvimarinasearesort.com.